The discovery of more than 300 weapon parts at a scrap metal dealership in Madampe has raised suspicions of a growing trade in firearms smuggled out from former war zones. The haul includes reusable parts of T56, T81 and 84S assault rifles, light machine guns and revolvers. Also detected were parts of largely obsolete self-loading rifles (SLRs) and G3s. On April 9, Madampe police raided the premises of J.H. Metal in Suduwella on a tip-off. An officer involved in the search said the weapon parts were found in empty fertiliser bags in contrast to other scrap metal, which were heaped openly on the ground. J.H. Asoka Chandana, proprietor of the scrap metal business establishment, was arrested and produced before Chilaw’s Acting Magistrate Nissanka Rupasinghe. The Madampe police filed a B report to court saying he was detained for being in possession of parts of firearms. Mr. Chandana was not produced in open court and was granted personal bail of Rs. 100,000 amidst police objections. He is required to mark his presence with the police twice a month. The firearm parts are in court custody. Police are conducting investigations and are yet to file a plaint. Of Mr. Chandana’s three lawyers, two are members of the ruling UPFA: Hillary Prasanna Fernando is the chairman of the UPFA-controlled Chilaw Urban Council. Samantha Fernando is a former UPFA member of the Wennapuwa Pradeshiya Sabha. He lost his seat at the 2011 local government election. 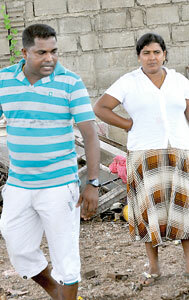 Making money with scrap: Businessman Chandana with his wife. While UC Chairman Fernando did not deny that he appeared for Mr. Chandana, he maintained he had no “personal knowledge” of the case. He said only parts of weapons had been found at the business establishment of his client and that he would not comment further as the matter was before court. The Firearms Ordinance makes it illegal for any person to possess “any part of a gun” unless he is a licensed dealer, manufacturer or repairer for the purpose of his lawful business, or a person who requires such part for any gun he is licensed to possess. Mr. Chandana did not fit into any of these categories. Interviewed at his residence on Wednesday, Mr. Chandana denied that he had stored away the firearm components in bags. He claimed that they had been “lying around here and there” when the police raided his property. He said the weapon parts had come in with other scrap metal transported every day from the North to various dealerships, including his own. Mr. Chandana also said, alternately, that he didn’t always check the contents of the loads he received; that he hadn’t known what these parts were; that only when the police came had he known it was illegal to keep them; and that he had kept the parts only because they were too long to transport. But during a brief tour of his collection centre, Mr. Chandana pointed to a man who was slicing through the larger sections of metal using a gas cutting machine. “We cut them before transporting them,” he explained. He later said he would have shortened the firearm parts in a similar fashion– except that it was Avurudu and he didn’t have the staff to do it. The air around Mr. Chandana’s house smells acridly of rust and dirt. 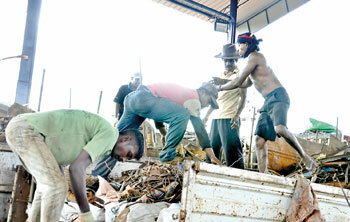 Workers are unloading and sorting through a fresh pile of junk that has arrived at J.H. Metal for the first time since the National New Year. The scraps are carefully separated according to the composition of the metal. There are 26 other scrap metal businessmen in this village. They compete intensely for material, mainly from the North and the East where the conflict has spawned a lasting supply of twisted, corroding metal. J.H Metal is located just outside the walls of Bhuwalka Steel Industries Sri Lanka Ltd., an Indian firm that buys scrap from local middlemen and melts it down to produce construction rods. It suspended business with Mr. Chandana some years ago over “issues of trust”, a company source said, confidentially. Mr. Chandana now supplies a company in Ja Ela with scrap metal. He owns five ten-wheel lorries in which the stocks are transported. He is one of the largest wholesale dealers of scrap metal in Madampe. Nailed onto the fa�ade of Mr. Chandana’s single-storey abode is an altar with a white Buddha statue. A faded ‘Mona Lisa’ gazes enigmatically down from her spot above the front door. A sarong has been spread out to dry on an armchair on the untidy verandah. There are empty beer bottles in crates, remnants of a New Year party. When the Sunday Times arrived at his residence, Mr. Chandana was away worshipping at two Hindu temples in town. It was his wife that telephoned him to say someone from the papers had come. “I got really scared when I was arrested,” he confessed. “I thought I wouldn’t get to spend Avurudu at home.” As his luck would have it, that didn’t come to pass. The main suspect, J.H. Asoka Chandana, said the firearms came with scrap metal from the North. He did not coherently explain how he managed to collect such a large number of parts. His interview with the Sunday Times was replete with inconsistencies but he did make one valid observation — vehicles transporting scrap metal from the North are unloaded and checked by security forces at the Omanthai checkpoint on the Jaffna-Kandy A9 road. The Sunday Times confirmed with a senior army official on the ground that many categories of goods brought from the North to the rest of the country are no longer fully unloaded and examined. However, he said, consignments of scrap metal are still checked as thoroughly as possible. It is unclear, therefore, how usable components of firearms made their way from the North to Madampe. Under normal circumstances, security forces and police take custody of firearms unearthed or otherwise discovered in former conflict areas. A police officer in Madampe confirmed that all the weapons had serial numbers. He also said that the police had cleaned them with diesel to gauge their quality and to decipher these numerals. The serial numbers will be checked against records in an effort to determine where the weapons had come from. The police officer said the weapon parts were “second hand quality” and that many of the components could be used. They were not greased, indicating that they had not been used for some time. He suspected that they might have been accumulated for sale to the underworld. A Colombo-based ballistics expert who saw photographs of the illicit haul said that some of the T56 weapons found had “only the firing pin missing”. He said a “kamhal karaya” would be able to put together a weapon in no time, should these parts fall into his hands.